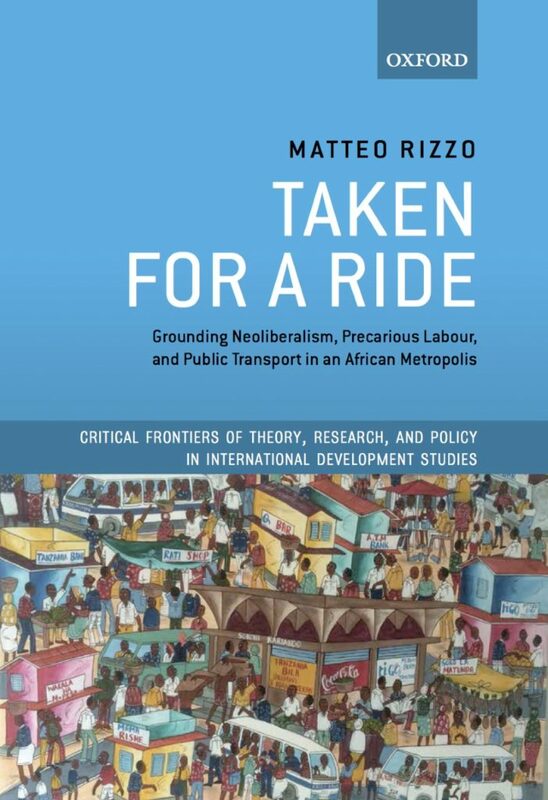 ROAPE talks to Matteo Rizzo about his new book Taken for a Ride, based on his research in Dar es Salaam. The book is a detailed study of public transport in Dar es Salaam and provides a profound examination of the transformation of society, state and politics in Tanzania since the 1970. As Dar es Salaam grew, Matteo writes, so did the demand for public transport and public transport provision experienced chronic difficulties. Taken for a Ride is a major contribution demonstrating the continued analytical relevance of radical political economy, challenging the claim that class analysis is necessarily dogmatic and reductionist. Can you introduce yourself and tell us about how you came to do research in Tanzania in the 1990s? I am from Palermo, Sicily, Italy. I am a political economist. I trained in political sciences at “L’Orientale”, in Naples, and development studies and economic and social history at SOAS, University of London, where I currently work as a senior lecturer in the department of development studies. My interest in Tanzania stems from having studied Swahili for four years as part of my first degree in political sciences with focus on Sub-Saharan Africa. Orienting my research towards Tanzania then became a kind of induced choice, as the interest in the country and fluency in Swahili allowed me to undertake research in a way that I was unable to do in other countries. Could you explain the genesis of your new book, Taken for a Ride? What was your own journey to this research and how did the idea of it evolve? The research project has a relatively long gestation. It began back in 1996 when, immediately upon arriving in Dar es Salaam, on my first visit to Tanzania as a Political Sciences of Africa student, I developed an interest in the city’s public transport system, and in particular its daladala, as the minibuses which provide public transport are known in Swahili. Seemingly ubiquitous, colourful and painted with aphorisms, these buses caught my attention, as the sound of the workers calling the stops to attract passengers on board is the soundscape to the city. This early interest was soon accompanied by the reflection that these private buses dominated the transport system of what was once one of the most famous socialist experiments in Africa. I therefore decided to focus my undergraduate dissertation (and subsequently my MSc dissertation at SOAS) on the city’s public transport system, its history and political economy. My doctoral work, still at SOAS, but on a different topic and discipline (on late colonial and postcolonial development history) took me to Dar es Salaam again, as I carried out archival work in 2001-2002 in the city. Days in the archive would often terminate with visits to a group of daladala workers on whom my research had focussed in 1998. Studying labour relations in bus public transport, as key to understand how public transport works in Dar es Salaam, and for whom, was my main research interest at this stage. When I re-joined academia in 2008, following a 3-year career break, I continued to research public transport in Dar es Salaam through short research trips in 2009, 2010, 2011, 2013 and 2014. In the most recent fieldwork spells, my research aimed to make sense of two important changes in public transport which had emerged since 2002. First, its bus workers had organised and in partnership with the Tanzanian Transport Union had begun, slowly but surely, to struggle for labour rights. Understanding how workers organised, their strategy and achievements to make demands on employers and the state, became one of my research objectives. Second, the World Bank-sponsored Bus Rapid Transit (BRT) began its very slow implementation. I studied the reasons for this delay, which had to do with the various ways in which a range of Tanzanian actors that stood to be displaced by BRT orchestrated their resistance. All in all, what held together my evolving research focus on public transport in Dar es Salaam over the years was its interest in understanding its different and changing facets of power and . Can you describe how the political-economy of Dar es Salaam public transport has evolved since independence? Is neoliberalism a useful prism through which to view its liberalisation? The trajectory of public transport in Dar es Salaam mirrors that of most African cities. It was provided by the state under monopoly regime since 1970. As Dar es Salaam grew and so did the demand for public transport, public transport provision experienced chronic difficulties. The state, which was hit hard by the oil crisis of 1974, was unable to increase its supply of public transport. In 1983, reflecting broader changes in the direction of policy-making in Tanzania and in Africa, the provision of public transport was opened-up to private operators. The state retained substantial control over pubic transport until the early 1990s. Since then the state relinquished its control over entrance into the service and over fare levels. I would argue that neoliberalism is indeed a useful concept to understand, from the early 1980s to the present, Tanzania’s wider political economy, including its changing policies in the public transport system. Neoliberalism is to be understood as a political project, associated with a set of economic policies, and promoted through agents. Whilst wide-ranging in focus, neoliberal policies are rooted in the idea that the promotion of an individual’s economic freedom and private capital is the best way to organise economies and societies. To be sure, neoliberalism is a slippery concept and as such it needs handling with care. But those scholars who argue that we are better off abandoning its use if we are to understand urban realities in Africa (for one important example see Robinson and Parnell, 2011) miss the point, as there is much to be lost in rejecting the concept when making sense of how the public transport system in Dar es Salaam functions, or does not function, and the way in which it has changed over the years. One can empirically see how the promotion of neoliberalism, in complex and different ways over time, has proved to be the main force behind these changes. In the early 1980s, the state was ‘rolled-back’ from the provision of public transport. In the early 2000s, an injection of over 150 million dollars laid the ground for Bus Rapid Transit (BRT), a public-private partnership in public transport. Under the plans, the public sector funds the BRT with tax payers’ money, while the private sector operates the system. While Dar es Salaam’s experience of a shift in the provision of public transport from public to private mirrors that of every main African city, the actual shape neoliberalism took in Dar es Salaam’s public transport and its politics was unique. The researcher’s job is to ground neoliberalism in particular contexts, and this requires attention to the domestic politics and path dependency of its promotion, and to the challenges and resistance that this triggered. This entails, first and foremost, identifying the range of different actors who had stakes in the sector, and on what sorts of power, if any, they drew in their attempts to influence developments in it. You mention Mike Davis’ Planet of Slums, in which he describes the demise of the post-colonial state development project from the 1970s. Perhaps let me start with the strength and importance of Davis’ book, which lies in what was arguably its intended goal, the systematic debunking of mainstream fantasies of slum improvements and of the potential for poverty eradication and economic mobility within the informal economy. His focus on how structural forces influence the nature of the urban poor’s experience of the city in developing countries is important, if chilling. Behind the apocalyptic tone of his Planet of Slums, that so many readers find excessive and disturbing, lies the fact that urbanization in Asia, Africa, and Latin America—unlike urbanization in the nineteenth century in the now-developed world—has often not been accompanied and driven by economic growth and industrialization. Davis crucially reminds us that, because of this, many poor countries host ‘cities without jobs’, as the number of job seekers in them has grown rapidly, while the capacity of the formal economy to absorb labour has decreased, rather than expanded. As a consequence of this imbalance, the majority of people are pushed towards work in the informal economy, the last-resort employer of this ‘surplus humanity’. These are insights that go a long way in explaining how public transport works and for whom, in Dar es Salaam. As Taken for a Ride discusses at length, the speeding, overloading of vehicles and the general disregard of road safety by transport workers are to be understood as the reaction of workers to their “squeeze” by bus owners. They expect a very high sum of money from workers at the end of each day, a sum that workers can accumulate only by working very long days (16 hours on average). And to understand why workers have limited bargaining power when confronting employers, we need to understand that the lack of structural transformation and industrialization in Tanzania resulted in a highly dysfunctional labour market, with a pronounced shortage of jobs for unskilled workers. Once more, as Davis so effectively put it, ‘cities without jobs’. Critics identify two main weaknesses in Davis’ work. One is what they see as its excessive focus on structures and its lack of attention to the historical agency that the poor might exert in cities either to change the grim conditions in which they live and work, or even to survive them. There are indeed examples of left-leaning writing which is overly deterministic in its attention to structures. However, what I find problematic about this reading of Davis’s work on slums as hopelessly pessimistic, is that Davis planned to write, with Forrest Hylton, a sequel book on ‘the history and future of slum-based resistance to global capitalism’ (Davis 2006: 201, 207), on the basis of ‘concrete, comparative case studies’, exploring ‘the bewildering variety of responses to structural neglect and deprivation’ and ‘the myriad acts of resistance’. This sequel book was never written, but the very fact that it was planned raises questions about dismissing Davis’s work as conceptually blind to issues of agency by the poor. A more valid criticism is its tendency to over-aggregation, whereas a more descriptive ‘exploding’ of the slums was, perhaps, necessary. For example, lumping the entire population of Soweto, home as it is to about two million residents in Johannesburg, under the category of slum resident, conceals its remarkable heterogeneity, which includes relatively wealthy areas. You challenge some of the literature on the African city as ‘unhinged from the material and the economic’. Can you also talk about this challenge you make to the ‘romantic and unsubstantiated celebration’ of the poor? This book is entitled Taken for a Ride because its analysis aims to debunk two misleading narratives that have become dominant in writing on African cities and on their informal economies. The first, which can be dubbed as ‘postcolonial’ is associated with the influential work of, among many others, Pieterse, Robinson, and Simone. Its celebration of the functionality of African cities, and of the agency of the African urban poor, including their initiatives in the informal economy, pays inadequate attention to the magnitude and nature of the structural forces at play in African cities and in the informal economy. It also fails to articulate whether and how the alternative order and social fabric woven by urban poor initiatives, to which their works refer, help to address the structural problems of African cities or the structural disadvantage faced by the poor. A second narrative is that informed by mainstream economics, of which De Soto’s market fundamentalism is the best example. Its celebratory reading of informal economic activities as poor people’s empowerment is equally unconvincing, as it presents a rosy conceptualization of the nature of markets and how they work. A close examination of the reality of working in the informal economy in public transport in Dar es Salaam, and of the operations of private operators in unregulated markets, will suggest that the superior efficiency of the private individual in ‘free markets’, which has informed policymaking since the early 1980s, is no more than an ideological article of faith. It will also show that readers on urban Africa and their informal economies are not the only category who have been taken for a ride; passengers’ experience of Dar es Salaam public transport following economic deregulation was very different from what the advocates of reforms had promised, as speeding and overloading became the trademark characteristics of the inefficient private operators which supplied public transport to the city. What the postcolonial and mainstream economics approaches share is a lack of attention to the political and economic structures in which we need to locate the study of the agency of the poor and the barriers that stand against their efforts to improve their circumstances. Your book is a sustained challenge to a sloppy understanding of Tanzania and the continent in much of the scholarly analysis – shorn of a rigourous critical political economy and class analysis. How would you assess the dominance of these approaches in African studies in general and in your research and writing on informalisation and the city in particular? Obviously Roape is atypical, and inspiringly so, in its tradition of class analysis and critical political economy. But outside Roape, class analysis and critical political economy have become unfashionable since the late 1980s. A glance at the programmes of the large African studies conferences, like ECAS, ASAUS or ASAUK, and of the keynote speakers and the themes around which panels are populated, signals the strong influence of postcolonial approaches in African studies today. Mainstream economics still holds a lot of influence in development studies and economics. But there is increasingly more and more attention to labour and class, and I hope that Taken for a Ride can be a small contribution to show the analytical and political relevance of radical political economy and to challenge the claim that class analysis is necessarily dogmatic and reductionist. It is not just at the level of ideas, you mention that some of these ideas influenced policy makers, i.e. de Soto’s work praising neoliberalism. Can you talk briefly about this? De Soto sees growth of the informal economy as the consequence of a choice by entrepreneurs, rooted in their spontaneous and collective response to over-regulation by predatory state apparatuses. De Soto puts forward a simple idea, and a very seductive one for policymakers, that the informal sector exists in separation from the formal sector, and it is the refuge of the urban poor who are excluded from the formal economy. De Soto pays no attention to internal differentiation within the informal economy and to whether such differentiation impacts on how informality works for different kinds of people. This is part of his explicit downplaying of the explanatory power of class. Its usefulness, he suggests, has been made redundant by the (alleged) reality that self-employment and working for a family business are the dominant employment relations in the informal economy. As de Soto put it, ‘Marx would probably be shocked to find out how in developing countries much of the teeming mass does not consist of oppressed legal proletarians but of oppressed extralegal small entrepreneurs’ (de Soto 2001: 229). The influence of these ideas on policymakers can be seen in the many programmes promoting the formalization of property rights and small businesses, which have been rolled out across developing countries, Africa included. Their record in unlocking the productive potential of the poor has been far from positive. While microcredit has different roots, it is an intervention that dovetails effectively with the narrative of the informal poor as small-scale entrepreneurs, and on that premise it has attempted to foster their financial inclusion, with very mixed results. Above all, this approach, and the interventions that emanate from it, suffers from ‘jobs dementia’, as Amsden (2010: 60) memorably termed it: the belief that by supplying credit or training to self-employed entrepreneurs, demand for such businesses will, somehow, materialize. Urban poverty-reduction efforts must rest on a grounded study of urban capitalism and the place of the poor in it, rather than on idealised and misleading notions of entrepreneurship. In place of the twin faults of the literature – vague ‘romanticism’ on informalisation and ‘market fundamentalism’ – you pose a non-teleogical and non-deterministic Marxism. Can you explain how you see this approach as superior, and how its helped to clarify your research in the book? As I said, the urban poor must be located within an economic, social and political context. Making sense of the formidable structural forces the informal poor are up against is crucial to understanding their agency in the process of development, in a less romantic and more grounded fashion. In this case-study of urban public transport in Dar es Salaam and its development over time, first and foremost, I use class as a relational concept. Ownership of capital (such as land and other assets, most notably buses in this case), as opposed to the sale of labour power to those with such capital, determines people’s class position in the structure of a given society, and their economic stakes. The social relations between capital and labour, and the dynamics of class formation over time, are the key drivers (but not the only ones) of processes of socio-economic change. Their study must begin with questions such as ‘who owns what’ and ‘who does what with it’ as these are key to understanding the nature and actors of capitalist development. Only by posing such questions can one see that the private operators of bus public transport in Dar es Salaam are differentiated between those who own the vehicles and those who work on them. Posing these questions also reveals that the employment relationship linking these two classes is central to the way in which the service of public transport is provided, with all its tensions. The consequences of unregulated employment relations affect not only workers but also Dar es Salaam’s public; speeding, overloading buses, and refusing transport to school pupils are to be understood as practices through which workers respond to exploitation by bus owners. Second, while class matters, its manifestation is messy and in many ways elusive, as one can observe different categories of transport workers, with different roles and interests, in the labour process. The book draws on Bernstein’s conceptualization of this phenomenon in terms of ‘classes of labour’ to make sense of this. The common ground of these workers, is that the sale of labour power is their main source of income. Third, the identity, political consciousness, and capacity to act collectively by ‘classes of labour’ cannot be ‘read off’ from their socio-economic position in society in a teleological or functionalist fashion. This means that the study of labour identity(ies) and the extent to which it is experienced and expressed—or not—in class terms is an important line of enquiry in itself and one that requires attention to the way in which workers’ activists and transport unionists constructed a shared meaning of exploitation to then act upon it. None of this approach is teleological or deterministic, as critics of Marxian political economy too hastily suggest. I wonder whether you can say something about the nature / character of Tanzania’s ‘socialist’ past and the ways this has influenced/impacted on the liberalisation of Tanzanian society? How also has it impacted the development of resistance to these reforms? Post-socialism is indeed an insightful analytical lens to understand neoliberalism, its politics in Tanzania, and the ambivalent positions of the Tanzanian government towards economic reform, including the direction of public transport in Dar es Salaam. The Tanzanian government has been seen as a model implementer of economic liberalization in many ways, but far from straightforward in its commitment to it, as values and discourses from the socialist period both called for and informed its attempts to intervene in the economy. Research on Eastern and Central European countries, and on China, has thrown important light on the hybrid and contradictory thrust of policy-making in countries embracing economic liberalization following the demise of socialism. Among Africanists, Pitcher and Askew incisively argue for more historical depth in much research on neoliberalism on the continent and in particular for an understanding of ‘whether, or how, a socialist past might shape a postsocialist present’ (Pitcher and Askew 2006: 3). In paying attention to Tanzania’s socialist past and what is left of it, one must begin by noting that its ruling party, the Tanganyika African National Union (TANU) first and then Chama cha Mapinduzi (CCM), has been in power since independence. Since then, TANU/CCM transitioned from being the spearhead of ujamaa, as Tanzanian socialism was named from 1967 to the mid-1980s, to being the implementer of one of the most comprehensive experiences of economic liberalization in sub-Saharan Africa, and one for which Tanzania became one of the donors’ darlings. Throughout the process, the uses of the socialist past have been open-ended, as different actors have exploited in different ways concepts that were central to the building of a socialist nation under ujamaa, such as egalitarianism, social justice, and state ownership. These have been reappropriated and/or reworked, both to resist economic and political liberalization and to justify it. As Taken for a Ride shows, in the case of public transport, socialist ideals have been mobilized to bring back notions of social justice and public ownership in the liberalized economy and to justify attempts, with limited capacity and success, to bring back some degree of regulation in the liberalized sector. You write in detail in the book about the development of the transport workers organisations and how workers organise themselves in the sector. What factors mitigated against an effective collective response to their situation? As one transport worker wrote on the back of his bus, “Kazi mbaya; ukiwa nayo” [Bad job, if you have one]. The relatively unskilled nature of work in public transport, and the oversupply of unskilled workers in Tanzania today, is the first aspect to bear in mind when understanding the barriers to workers’ organization. The mismatch between demand for work in the sector and existing employment opportunities significantly undermined the bargaining power of daladala workers when facing employers, as the oversupply of workers forces workers to accept very long working days, and uncertain and meagre returns. Then there is the related issue of the fragmentation amongst different ‘classes of labour’ performing different tasks, and with different interests, as overworked workers call on underemployed workers, to whom they sub-contract part of the working day. Finally, the spatial unit in which transport work is performed matters as the atomised nature of work in buses, as opposed to a factory, was a barrier to the emergence of workers’ effective collective response to their plight. These were significant constraints to the organization of workers. But none of the barriers above should be crudely seen as destiny, the course of which cannot be changed. 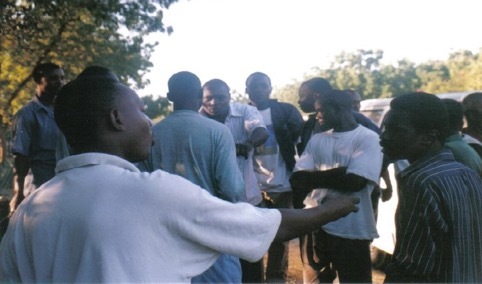 As I learned from later rounds of fieldworks, a group of workers successfully established a workers’ organization in the late 1990s, and over time, in partnership with the Tanzanian transport trade unions, achieved limited but substantive gains through their demands on employers and the state. How workers’ organised and what were their goals, therefore became part of my study. 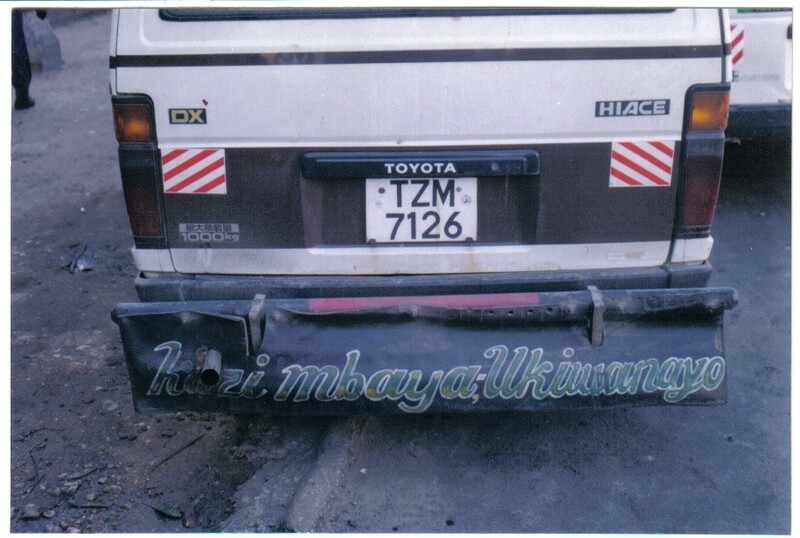 ‘Kazi mbaya; ukiwa nayo’ (Bad job, if you have one) on the back of a taxi in Dar es Salaam (Matteo Rizzo, 2002). What conclusions would you draw from your research on labour possibilities and what the ‘unorganised’ can achieve in an informal economy in the Global South? I think we can draw out three related conclusions. The first one is about time-frames in research. Struggling for labour rights in this segment of the informal economy entailed a slow effort at constructing a common ground between informal workers and their Union counterpart. The complex nature of this process partly explains the very slow pace at which change took place. So, we need to allow adequate time-frames when studying the political organization of informal workers. The second conclusion is methodological, as the book shows the value of class-based political economy as an analytical approach. Far too often, studies on economic informality skirt around the questions of who owns what, and with what outcomes, in the informal economy. By contrast, this study demonstrates that understanding the way in which the workers are linked to (capitalist) employers, locating workers within their economic contexts, and mapping the sources of both their precariousness and power, is essential in making sense of whether, why and how workers mobilize politically. Asking these questions in no way condemns the analysis to functionalism and reductionism, which are certainly features of some work in the radical political economy tradition, but which can be avoided. Taken for a Ride does not simply read off workers’ political interests from their economic position in society, nor has it identified the economic position of workers as the only predictor of what was politically possible for them. Indeed, the very barriers that prevented the organization of these workers up to 1995 were then overcome through the initiative of some workers and the events that unfolded subsequently. The third and final lesson to be learned from this study is that its findings challenge widely-held beliefs: that collective action by organized (or organizing) labour belongs to the past; that the problem poor people face is not one of adverse incorporation and exploitation by capitalism through informal and highly precarious work; and that social protection is a more realistic and strategic policy target in tackling workers’ precariousness. The workers who are the protagonists of Taken for a Ride share the lack of a clear employment relationship to their employers—the main characteristic that, it is argued, prevents workers’ mobilization for a ‘rights at work’ agenda in the informal economy. While this was indeed the main source of workers’ precariousness at work, it was also the very stimulus and goal of their mobilization. When challenging, with some success, the unclear nature of employment relations in the sector, workers drew on the significant structural power they commanded as providers of the cheapest form of available public transport. While the circumstances and context in which these workers’ mobilization took place are necessarily specific, the broader lesson is that we need to disaggregate the realms of the possible for different groups of workers in different economic sectors and countries. Above all, rather than celebrating prematurely the death of organising and organised labour, my work is a call to put ongoing labour struggles at the centre of our reflection on the possibilities for action by precarious workers. Matteo Rizzo is a Senior Lecturer in Development Studies at SOAS, University of London. Matteo has degrees in Political Sciences from “L’Orientale” (Naples, Italy) and Development Studies and History from SOAS (MSc and PhD), where he also completed an ESRC postdoctoral fellowship. Matteo has taught at the LSE, at the African Studies Centre in Oxford and in Cambridge, where he was a Smuts Research Fellow in African Studies at the Centre of African Studies. Matteo is a member of the Editorial Working Group of the Review of African Political Economy and works on public transport for the International Transport Workers Federation. Taken for a ride: Grounding neoliberalism, precarious labour and public transport in an African metropolis. Oxford: Oxford University Press, Series on Critical Frontiers of Theory, Research, and Policy in International Development Studies (for readers of roape.net on the publishers page please enter the code ASFLYQ6 for a 30% discount on the cover price). Amsden, A.H. 2010. ‘Say’s Law, Poverty Persistence, and Employment Neglect’. Journal of Human Development and Capabilities 11 (1): pp. 57–66. Bernstein, H. 2007. ‘Capital and Labour from Centre to Margins’. Prepared for the Living on the Margins Conference, 26–28 March, Stellenbosch, South Africa. Davis, M. 2006. Planet of Slums. London and New York: Verso. Pieterse, E. 2008. City Futures: Confronting the Crisis of Urban Development. London and New York: Zed Books. Pitcher, A. M. and Askew, K. M. 2006. ‘African Socialism and Postsocialism’, Special Issue of Africa 76 (1): 1–14. Robinson, J. 2006. Ordinary Cities: Between Modernity and Development. Questioning Cities Series. Abingdon, UK: Routledge. Robinson, J. and Parnell, S. 2011. ‘Travelling Theory: Embracing Post-Neoliberalism through Southern Cities’, in G. Bridge and S. Watson (eds), The New Blackwell Companion to the City. Oxford: Blackwell, 521–31. Simone, A. 2004b. For the City Yet to Come: Changing African Lives in Four Cities. Durham, NC: Duke University Press. de Soto, H. 1989. The Other Path. New York: Harper and Row.